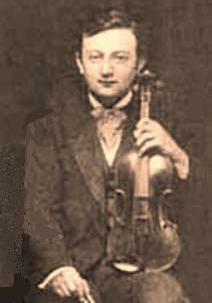 Hans Letz (Jean Letz) was a German violinist born (in Ittenheim) on March 18, 1887. He is mostly remembered as a teacher of many students at Juilliard (New York.) He studied at the Strasbourg Conservatory and at the Berlin Royal Academy of Music with the famous Joseph Joachim (1831-1907), concertized in Europe for a while then came to the U.S. in June of 1908. He was 21 years old. He soon joined the Chicago Symphony (in 1909) and was appointed concertmaster in 1910. Theodore Thomas had already left the scene, so to speak. Letz left this position in the spring of 1912 and in May of that year joined the Kneisel Quartet (the best string quartet in the country according to several critics) as second violinist. (For some odd reason, Chicago Symphony concertmasters do not stay on for long periods, unlike other top orchestra concertmasters at the New York Philharmonic, the Boston Symphony, the Cleveland Orchestra, and the Philadelphia Orchestra.) Letz also began teaching at the Institute of Musical Art (now Juilliard) in 1912 and continued doing so until 1920. When Kneisel disbanded the quartet in 1917, Letz formed his own – the Hans Letz Quartet it was called. It was active until 1925. It is doubtful that any recordings of the quartet exist – I do not know. Letz then again taught at Juilliard (the Institute of Musical Art) from 1925 onward. He was 38 years old. Letz retired from Juilliard in 1960, though he took two years off between 1956 and 1958. He had been there more than forty years. Letz played a Pressenda violin from 1829, a Guadagnini from 1783, a Testore from 1739, and a Montagnana from 1730. The Guadagnini eventually ended up in the hands of Lorin Maazel, a sometime violinist who became a conductor - he sold it late last year for an undisclosed sum. Letz is said to have favored a small, refined tone, especially suited to chamber music. Among Letz’ many pupils are Mary Canberg, Dorothy DeLay, Sally Thomas, Vittorio Giannini, Anatoly Kaminsky, Robert Kurka, Peter Marsh, Calvin Sieb, Andor Toth, and Patricia Travers. Hans Letz died (in Hackensack, New Jersey) on November 14, 1969, at age 82, largely forgotten.